Everyone knows it, but in racing, sometimes the fastest car doesn’t always win. Just ask Scot Smith. Smith was the surprising quick qualifier for Saturday’s Rattler, then backed that up by jumping right out to the lead at the start. 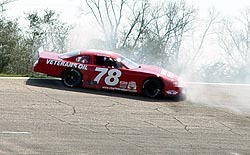 In fact, he did It twice after the first start was waved off following an accident before one full lap was completed. And even more impressive was the guys that Smith got the jump on at the start of the event that were lined up behind him, including former Rattler winner Charlie Bradberry, who started second, along with Donald Long, Junior Niedecken and Jason Hogan. Sanders said it was just a racing deal. Smith’s car was done for the night, while Sanders continued on. However, race officials sent Sanders to the back of the pack after the incident, putting him a lap down yet again. “Some of the calls that were made tonight were a little strange,” added Sanders. “We had a coil wire come off. 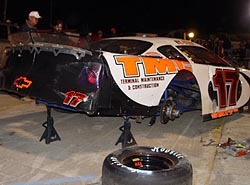 We were running third and heading to the front, but the coil wire came off and put us a lap down. We made it up (when we got together with Smith) and they said we didn’t make it up, so we had to make it up again. We did and I guess we were lucky to get third. And while Sanders got third, Smith had nothing but a torn up car. 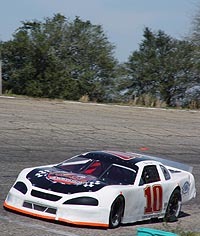 Ronnie Sanders ran third in the Rattler. “I’m disappointed in myself,” said Smith. “But anyone that has been racing long enough knows Ronnie and knows how he drives. I should have known myself. I guess I’m to blame for not letting him go. “I’m disappointed because I’m not carrying the money and the trophy home, but I’m really disappointed for my (crew). That is what the guys are here for, to carry that trophy around. This isn’t Cup or anything like that. They will show up at six at night and work their butts off on this car. They will take off wok and come down here and all they want is that trophy. Oh well, I guess there will be another Opp, and we’ll come back down. To say that Charlie Bradberry had an interesting Rattler would be a massive understatement. Bradberry had to fight from the back of the pack not once, not twice, but three different times in Saturday night’s 200 lap Super Late Model showdown, but was able to fight his way back up to seventh by the time the checkers waved at the end of the night. Bradberry was able to work his way back near the front before a second round of pit stops, this one under normal yellow flag conditions, brought him into the pits on lap 133. 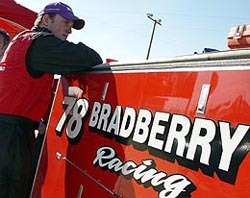 A fantastic stop by the #78 team got Bradberry out just behind Eddie Mercer after sensational four-tire stop. Mercer and Bradberry worked their way into first and second and started a fierce battle before the two got together while battling for the lead. Charlie Bradberry didn't have a very good Rattler. And for the second time, Bradberry had to battle from the back of the pack. Needless to say, Bradberry, still upset over the lap 75 call to put him at the back of the pack by race officials, was upset. It was a frustrating weekend for Charlie. 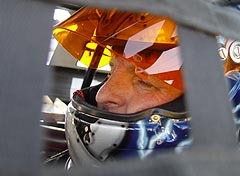 Bradberry's spin in practice just added to his bad Saturday at South Alabama Speedway. But Bradberry again fought his way into the top 10 before spinning again on lap 185, forcing him to the back of the field for the third time. However, in the last 15 laps, Bradberry was bale to claw his way back into the top 10 and salvaged his night with a seventh-place finish. It was a very quiet, yet very strong second-place run for Donald Long on Saturday night. Long, who started third, really never raced outside of the top-five most of the night and looked to have one of the only cars early that could compete with Scot Smith before falling back into a more “comfort” mode and riding for the rest of the night. Smith then impressed everyone even more by leading the race’s first 131 laps. But on lap 132, it was all come to a crashing end for Smith, literally. On lap 132, the lapped car of Ronnie Sanders, who had been working on Smith for several laps triying to get his lap back, finally got the better of Smith, but not in the good way. Sanders fell a lap down with mechanical problems after proving he was a top-five car early in the race. So as Sanders was working on Smith to get his lap back, the two made contact. That contact sent Smith spinning into the inside wall on the backstretch, out of the lead and out of the race. “You don’t get a chance to drive a car like that very often,” said Smith. “We have been fast since we’ve been here. We were on cruise control out there. If we were getting pressure form behind, we could pick the car up. We could pretty much pick the car up at any given time if we needed too. You don’t get that a lot. Even though the officials race records will only show a total of 18 cautions in Saturday’s event, there were plenty more than that to slow the 200-lap race to nearly two and a half hours long thanks to the track’s ruling that a caution before a full lap is completed doesn’t count as an actual lap run. By the end of the race, when it was time to go, Long was able to move right up on the bumper of race leader and eventual winner Jason Hogan, but ended up falling back and working to hold off Ronnie Sanders for the runner up spot. 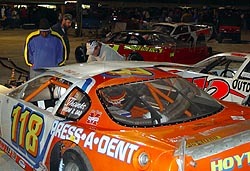 “I think we had a bleeder that was sticking on cautions and the car started getting tight on me at the end,” said Long. “We fought it good and stayed out of trouble. We dodged a couple of things out there and just kind of rode. That was the plan the whole night long. It started with a multi-car accident on the third turn of the first lap, involving notables Billy McGinnis, Ryan Crane, Stanley Smith, Eddie Mercer among others. However, all drivers were able to continue on with minimal damage. A majority of the cautions were the result of single car or two car spins. There were seven cautions before the 75-lap “competition caution” that brought the field to pit road. After that, there were 13 other cautions that slowed the field during the final 125 laps. There was plenty of damaged equipment sitting in the infield on Saturday night. Last year, Ryan Crane finished third at the annual Rattler. This year, he wanted just a little bit more. Two positions to be exact. And with about 40 laps to go, it looked as if Crane might just have a shot at finishing those two positions better. 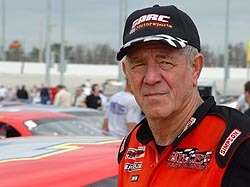 The youngster was running fourth and making a charge to the front, with his eyes set on Super Late Model veterans Donald Long and Ronnie Sanders next. However, with just 35 to go, Crane got a tap from fifth-place Bubba Pollard, sending the both spinning and to the rear of the field. From there, the night “went to pot” for Crane. He was involved in two other accidents over the race’s final 30 laps, leaving his car beaten and battered and Ryan with a 10th place finish. There were 30 cars that showed up to run the Rattler on Saturday, but only 28 started the race. For a while, it looked like even less than that would start, but a couple of drivers were able to fix their problems in time for the green flag and take the start. 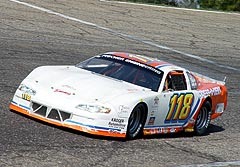 The most noticeable name that didn’t get a chance to take the green was that of Super Late Model veteran David Hole. “Earlier in practice, we decided to try our race set up after we already did a mock (qualifying) run,” said Hole. “I was just going to run 25 or 30 laps to see how the car was going to do in the race. I was relaxed in the car, just pacing myself. I came off of turn two and caught a glimpse of the idiot light (oil pressure light). It came on and I cut the engine really quick, even though it is hard to see it come on sometimes during the day. It was a disappointing run for Crane, who was looking to build off of three-straight top-10 finishes at Speedweeks in Florida last month and a third-place run at last year’s Rattler. “The car wasn’t exactly where we left it when we left here in the fall of last year. We made a couple of different adjustments to it and they just didn’t quite work. We’ll fix it and be back. David Hole's crew loads up the hauler on the front stretch after qualifying. Georgia while the rest of the teams prepped their cars for the race. 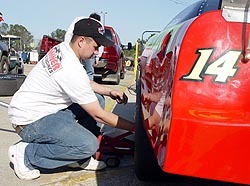 NASCAR Southeast Series regular Johnny Brazier also failed to start the event and didn’t even get a chance to take a qualifying run after grenading his engine right near the end of Saturday morning’s practice. Relatively new Super Late Model driver Josh Hamner was at the Rattler on Saturday, but not behind the wheel. Instead, he was behind the wrenches. Dave Mader III, one of the resident bad asses but all around nice guys in the Super Late Model world, had a short night on Saturday at the Rattler, finishing just 37 laps before mechanical problems put him out of the event. Driver Josh Hamner was in Opp, but helping out instead of driving. “We’re just hear watching and helping out Ken McFarland,” said Hamner, who was suppose to race at last week’s Early Bird at Birmingham (AL) before it was rained out. 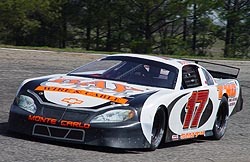 Instead, Hamner will be racing in Five Flag Speedway’s Blizzard Series in about a month and will spend time preparing for that and heading down to the track for an open practice session later this month. The one plus for Mader? His car was one of the few to leave SAS without any major body damage. 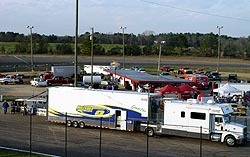 Mader is planning to run the Big 10 Series opener at Concord Motorsport Park on March 26h next. - Only 11 of the 28 starters finished the race and only eight of those 11 were on the lead lap.